This book tells the extraordinary story of Maria Botchkareva "Yashka", a peasant girl grown up in Siberia, who at the outbreak of First World War asked and obtained to enlist in the Russian army: not to be one of the many Red Cross nurses, but to be a soldier and fight. Yashka fought and distinguished herself at the forefront, so that after the revolution of March 1917 the provisional government of Kerensky allowed her to organize a women combat unit that was talked about by the press around the whole world, and that was submitted to massacre on the battlefield of the last Russian offensive. After the dismissal of the remains of her Women s Battalion of Death and the dissolution of the whole Russian army, Yashka managed to reach the West with the utopia of gathering funds to restore a people's army and to continue the war against Germany. In the United States, in 1918, her story was collected and published by a journalist of Russian origin, Isaac Don Levine. It is controversial whether and how the figure of Yashka belongs to the women emancipation movement, as at the time was considered by the same Emmeline Pankhurst, who was a supporter and a friend of Yashka. Indeed Yashka acted instinctively following an unconditional and non-negotiable loyalty to her country, because in this loyalty she found at the same time self-respect and redemption by the deprivations of her experience. By telling widely not only the facts, but also her own feelings and motivations, Yashka left us a testimony that rises far above the usual memoirs of war. 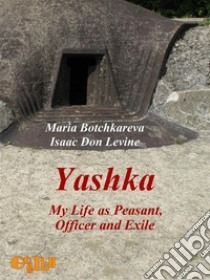 The story of Isaac Don Levine, fallen into oblivion for a long time, is now available again in this ebook, with an afterword by Alberto Palazzi that focuses on the definition of herself that Yashka was looking for in commitment and sacrifice for her country.